As your online business grows, you’ll need a hosting plan that can deal with the higher traffic, and still provide you with the performance you need. For many websites, shared or Virtual Private Server (VPS) hosting simply do not provide the speed or agility needed. If this is where you’re at, then you’ll want to take a look at cloud or dedicated server hosting. Both options can provide high-level performance and solid customer service, and will enable you to run large applications and handle traffic spikes on your site. Which one is the best option though? 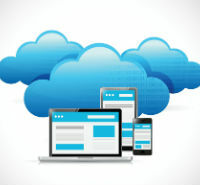 Here is a quick breakdown on the cloud vs. dedicated hosting debate. Let’s take a look at dedicated hosting first. When you sign up for dedicated hosting you will have your own server that no other website uses. No other website has access to your data, bandwidth, or physical housing, and you don’t have to worry if other websites are involved in online activities that could jeopardize the server. This means you will almost certainly enjoy better speed and more reliable performance than you would on a shared or VPS server. Put simply—you rent the entire server and all of the resources that come along with it. You get to decide which operating scripts and other software programs or utilities are supported by the server, and don’t have to make do with the default one provided by the hosting company. The whole building is yours, so to speak, and you get to design and operate it as you see fit. First things first: if you move up from shared or VPS hosting to dedicated hosting, you’ll be paying significantly more per month for hosting, in some cases several times more. You will also need to have some technical know-how, as you’ll be the one responsible for managing the server. This is great if you want to be able to customize your system just to your liking, but can be a real pain if the server crashes, or you have some other problem but lack the experience to take care of it yourself. With cloud hosting, your site is hosted on a series of servers located in many cases across the globe. It is similar in a sense to VPS hosting, except that the virtual resources are shared by several server computers that create their own cloud. This type of hosting provides significantly higher amounts of bandwidth and data transfer than what you can expect with VPS hosting. This means that you can benefit from the security provided by redundancy—if one server fails, you’re still online, just drawing resources from other servers in the cloud, and you don't have to worry about your site being stored only on a single vulnerable server. Your information is automatically backed up, and you also have better protection against data losses. Much like dedicated hosting, cloud hosting can be significantly more expensive than shared and VPS hosting. And unlike dedicated hosting, you aren't entirely in charge of your own personal server. The provider may have specific requirements regarding the operating systems you use. When you’re moving up from shared and VPN hosting, both dedicated servers and cloud hosting can provide you the tools and performance you need to keep things humming smoothly. Both systems will require a more significant investment than shared hosting options, and when making the jump, this should be one of the central considerations—do you need this extra performance and is it worth the expense? With dedicated servers, you are absolutely running the show with a server that is devoted solely to your site. This gives you the control, flexibility, and performance you need, but it might not be for everyone. Cloud hosting will provide you with redundancy to keep your site safe, is easier to use and requires less personal maintenance, and may cost less than dedicated servers. On the other hand, you will have less flexibility when it comes to deciding how the hosting runs. The bottom line? Both dedicated and cloud hosting can provide you with the hosting that you need, but both have their pros and cons. It’s up to you to take a long look at your site and what you need, and decide which is best for you. Still can’t decide if you need dedicated or cloud hosting? Maybe you need more information on all hosting options. Dig a little deeper here.